It’s probably the No. 1 versus No. 2 ruckman in the comp. It’s an exciting battle. The ruckmen do have a legitimate contest. Forwards these days rotate so heavily through the midfield, defenders pick up certain guys depending on where they go. Brodie versus Gawny will be a legitimate fight for that crown so to speak. The ruck battle is the last great head-to-head duel in modern football. And this week the two premier ruckmen in the AFL this season, Max Gawn and Brodie Grundy, will meet for battle at the MCG on Queen's Birthday afternoon. But which one can lay claim to be the best ruckman in the league? Table-1 presents some summary season statistics for both players. At a high level, Gawn would appear to have the upper hand in the ruck contest and Grundy when the ball is in open play. But which player has had the greater influence on match results? As most teams play only the one specialist ruckman, we can quantify a ruckman's contribution to a match not by their overall individual statistics, but their relative performance against their direct ruck opponent. We shall consider each of these statistics in turn and determine how much they contribute to an overall match result. Melbourne and Collingwood shall be used as case examples. A HOA is more than a simple hitout; it is a hitout that purposefully and directly contributes to the next chain of play. The relative importance of the HOA is obviously dependent on which part of the ground it occurred. And of course some teams that are lacking a quality tap ruckman may purposefully concede the ruck battle and setup at the stoppages accordingly, nullifying the possible positive impact the HOA may otherwise have had. So is winning the hitouts and specifically the HOA an irrelevance? The contested possession differential, i.e. how many contested possessions a team accumulates relative to their opponent, is the common go-to Key Performance Indicator (KPI) for a team’s performance. It has historically proven to be a good indicator of performance and season 2018 is no different. The contested mark is a subset of the contested possession but its relative importance is worth highlighting. The ability to take a contested mark can be an invaluable asset to a team, whether it is the goal saving mark in defence, the relieving down-the-line pack mark on the wing, or the forward-50 one-on-one. We can now use these weightings to determine the estimated net impact on a match that a ruckman has. To do that we need to assess the head-to-head battle of the primary ruckman in every game this season and determine the net scoreboard impact they are having in each game based on their differential performance in the above statistics. The result of such an assessment is presented in Figure-7. The figure presents the estimated net scoreboard impact of the leading ruckman in the AFL this season, i.e. on average how much they are influencing the match result. And from this summary, we can conclude that Max Gawn has indeed been the most effective ruckman in the AFL this season, averaging an estimated net positive impact of just over 3 goals (18.5 points) per game. Second in the rankings is Brodie Grundy who is averaging an estimated net positive impact of 13.3 points per game. Note: This article represents a continuation of a series of articles to determine the form players of the competition in each position. The premise is to assess each position based on an easily identifiable collection of variables. Each week the rankings will be updated and an All-Australian team will be auto-populated and presented on a stand-alone page. So far, metrics for rucks, key forwards, wingers, attacking halfbacks and key defenders have been developed. In all the metrics discussed in this article, Melbourne are ranked number 1 in the AFL. 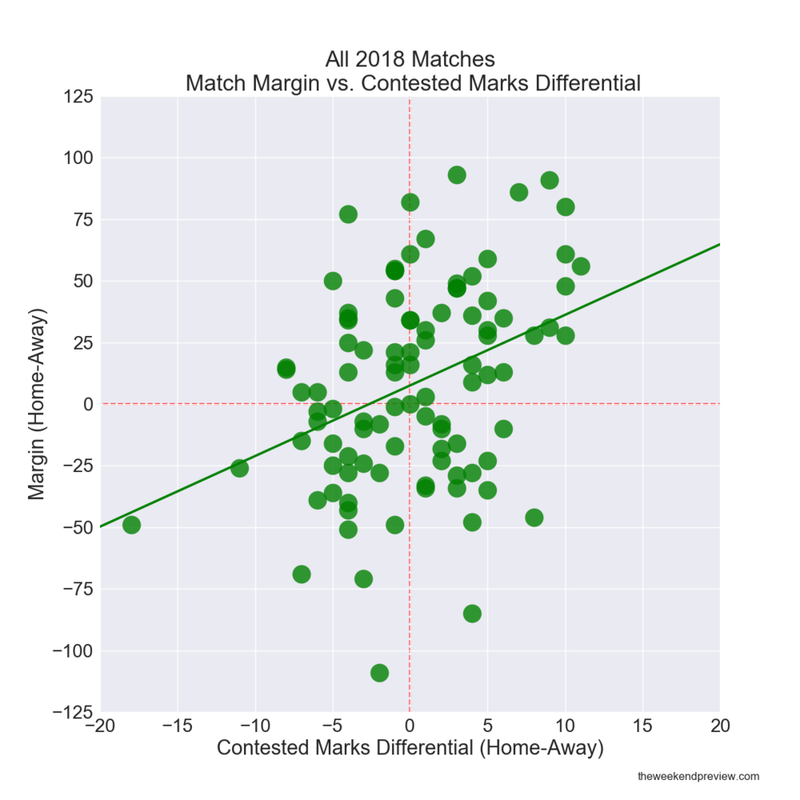 Collingwood are ranked second in Hitouts-To-Advantage and Contested Possessions. On current form, Collingwood are worthy of a spot in the Finals this year. However, it is hard to deny the form and, dare I say it, the premiership credentials of the Melbourne Football Club. Cherny, D. (2018).“Gawn, Grundy reaching for ruck crown: Pendlebury”. The Age, 7th June 2018. Champion Data. (2018). “2018 AFL Prospectus”. Champion Data Pty Ltd. Note: Data used in this article was sourced from AFL StatsPro on the afl.com.au website.